For David and I have decided, after 13 years together, that we will get married – and we had no doubt where we wanted the wedding to be. Yes, St Andrew’s at Aysgarth is a beautiful church and all those I know there would be able to attend if they wished. But David and I were in complete agreement that we wanted the simplicity of a ceremony which centres on the essence of a marriage between two people. George Fox, the founder of the Religious Society of Friends (Quakers), wrote in 1669: “For the right joining in marriage is the work of the Lord alone, and not the priests’ or magistrates; for it is God’s ordinance and not man’s; and therefore Friends cannot consent that they should join them together: for we marry none; it is the Lord’s work, and we are but witnesses. Some have asked why we wanted to go to Countersett when we could use Bainbridge Meeting House. In the past ten years, however, I have mainly attended Countersett Meeting House where meetings are held on the last Sunday of each month. I love the atmosphere there along with the opportunity to commune with God, usually in silence. Countersett Meeting House for us also means remembering John Warren who died earlier this year. An arrangement of bronzed autumn leaves that he created is still on one of the window sills. A Quaker wedding takes place during a specially –arranged meeting for worship and all who regularly attend local Religious Society of Friends meetings can attend. We are, however, asking them to let us know beforehand as we need to know how many coach seats are required and how many will be joining us for ‘afternoon tea’ afterwards. This will be at Sycamore Hall with the catering being done by the Corn Mill Teashop in Bainbridge. So slowly we are sorting out the logistics but, at the beginning, we needed to make sure we could be married at Countersett Meeting House. The first step was to meet with Richard Waldmeyer. The Marriage Act of 1753 explicitly exempted Quakers and Jews from the statutory regulation of all other marriages in England and Wales – and that has been reaffirmed by subsequent Marriage Acts in England. So, as the Quaker Registering Officer for our region, Richard explained what we had to do – starting with sponsors signing the necessary forms for me as, unlike David, I am not a member of the Religious Society of Friends. A big thank you to Liz Burrage and to David Ladyman for being willing to sign the forms at very short notice for, after so long together, we were suddenly in a hurry. Richard also explained that we needed to get certificates of marriage from a local Registry office as well as attend a Quaker Meeting for Clearness. So one morning we went to the Registry Office in Richmond to apply for those certificates which now take 28 days to process. The first problem was that the computer didn’t immediately recognise Countersett Meeting House. Thankfully the registrar resolved that problem and we managed to complete the paper work. After that we definitely needed some sustenance so made our way to one of our favourite eating places: Duncans Teashop in Richmond. My food intolerances have multiplied and become more severe recently so it was wonderful to be so well looked after – and to have yet another slice of their utterly sumptuous walnut and coffee cake which contains no cow’s milk products or potato starch. David, of course, treated himself to a slice of their wonderful treacle tart. So I entered the room with some trepidation. But there was nothing to worry about for the elder leading the meeting, Ian Hunter Smart, quickly put us at ease. It was a good example of a prayerful and loving Quaker meeting. Within a day the meeting houses in Leyburn, Bainbridge and Countersett were informed that approval had been given for our wedding to take place at the latter. Richard was at the Meeting for Clearness – and it was he that told us that the last wedding at Countersett was in June 1841! As one local Quaker said – ours will be a historic wedding at Countersett Meeting House. So the next time I was on duty as a volunteer in the Research Room at the Dales Countryside Museum in Hawes I had a look at the transcript made by Jack Handley of The Births Marriages and Burials, Records of the Society of Friends for Wensleydale and Swaledale which covers period from the 1680s to the 1770s. 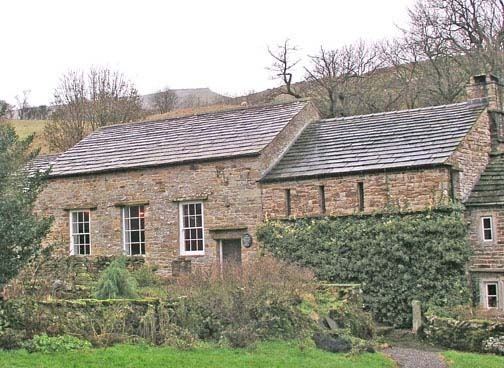 The first Quaker weddings in upper Wensleydale were held in the homes of members and that was certainly true of the first four at Countersett, three of which were in Richard Robinson’s house, Countersett Hall. Where that in 1709 was held is not clear as the date on the Meeting House is 1710. Sir Christopher C Booth wrote in The Quakers of C ountersett and their legacy that the Norsemen who colonised the upper dales before the Normans came were individualists and did not tip their hats to the gentry. Richard Robinson, he said, was such an independent-minded dalesman who, by the 1650s, was searching for a spiritual experience beyond that offered by the institutional church. When he heard about George Fox he went to Westmorland to meet him and was convinced. Like other Quakers at that time he was prepared to face considerable abuse and persecution to be part of this revival of the Christian faith. Booth noted: ‘It was undoubtedly through the influence of Richard Robinson and his friends that so many became Quakers in upper Wensleydale. At the same time, Richard’s extensive travels in Yorkshire and throughout the land, sometimes taking him as far as London, helped to spread George Fox’s teaching far and wide.’ Robinson died in 1693 and Quaker Meetings continued to be held at Countersett Hall until the Meeting House was built. When reading the diaries of George Fox I was particularly fascinated by his radical approach to gender equality and the impact that had on the development of female education. I was curious, of course, to find out more about the couple who were married at Countersett in 1841. They were Oswald Baynes, a farmer from Carperby of ‘full age’, and Agnes Webster, a ‘minor’ who was described as a housekeeper at Carr End near Countersett. The profession of her father was given as Linseed Manufacturer. When I searched for them in the 1851 census I had a surprise for I found they were living at Poynton in Cheshire. That’s where my eldest brother, Les, lives with his wife, Beryl. His daughter and son-in-law also live in Poynton. We often joke about the similarity of that name to David’s surname. In the 1851 Agnes was shown as being 29-years-old who had been born in Thirsk. She had two sons and two daughters – and the help of a 20-year-old female servant from Sedbergh. Oswald (32) was a farm steward at Tower Farm Yard. Ten years later he described himself as the farm bailiff at The Towers. By 1861 there were three more sons and the girls were at a Quaker boarding school in Winscombe, Somerset. Oswald continued to do well and by 1871 he had his own farm of 130 acres. His eldest son (also Oswald) went on to become an auctioneer in Chorlton on Medlock. I couldn’t find Oswald Snr or Agnes in the 1881 census and decided I would have to put aside any further research as there was so much to do with our wedding date fast approaching.